Rome is known, among other things, for its art, architecture… and dare I say, fountains. Rome is reported to have over 2,000 fountains, which is the most fountains in any city in the world. These fountains provide drinking water (some still do - even for the weary tourists). Many of the fountains are decorative and some have legends and history attached to them- like the Trevi Fountain. The Trevi Fountain is the largest, and probably the most famous of the fountains. The legend is that if you toss a coin over your shoulder, you will return to Rome. Although the coin toss was popularized in classic movies like Roman Holiday, and Three Coins in the Fountain, the practice actually dates back to ancient Roman times. If you think you are just throwing money away, rest assured that the estimated 3,000 Euros per day is collected and donated to charity. SWEET! Yes? Each time I have visited Rome, I toss my coin in the Trevi Fountain to ensure (or maybe “insure”) a return to the Eternal City. In September, my last coin toss paid off, and I had an opportunity to return to Rome. At the end of my travels, I try to make a list in my journal to document things I was glad I packed, things I wish I had packed, places I would like to return to, and places I did not get a chance to see but want to visit on my next trip to the city/country. As I reviewed my 2010 Italy journal entry, it reminded me I needed to find Piazza Narvona this trip. Okay. It took a LOT of walking to find Piazza Narvona, and I am so glad I put forth the effort. I think it became my favorite Piazza this trip. The sound of music was the first clue I had found the Piazza. Oh my, what sweet sounds. And, there are three, count ‘em THREE fountains. It’s not known as a “grand theater of water” for nothing you know. The Neptune fountain is at the north end of the Piazza and includes the God of the Sea spearing an octopus. The fountain at the south features a figure wrestling with a dolphin. 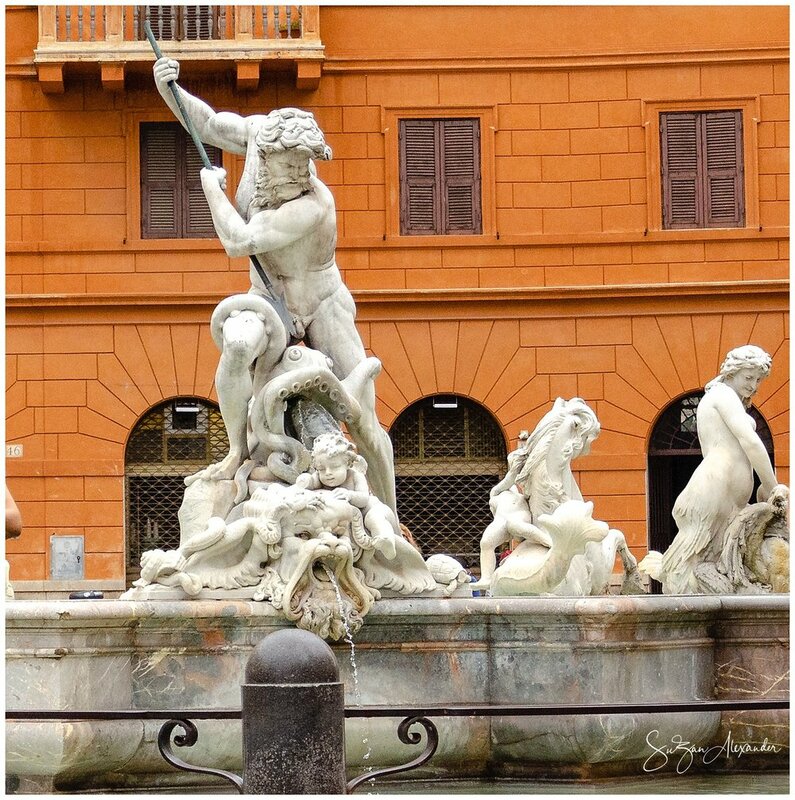 This fountain in the center of the Piazza was created by Bernini. I wondered what the symbolism of the the four rivers was all about. Well, it is because it represents the rivers from the four continents which papal authority had spread. The four continents and the four rivers are: (i) Nile (Africa), (2) Danube (Europe), (3) Plate River, or, Rio de la Plata (Americas), and (4) Ganges (Asia). What is your favorite (fountain/place/food/restaurant…) in Italy? Do share so we can all add them to our “must see/do” column in our journals. WHERE IN THE WORLD IS THE REPTILE?